Fred Astaire and the Mana Pools National Park. – Crickey…….we're in Africa! 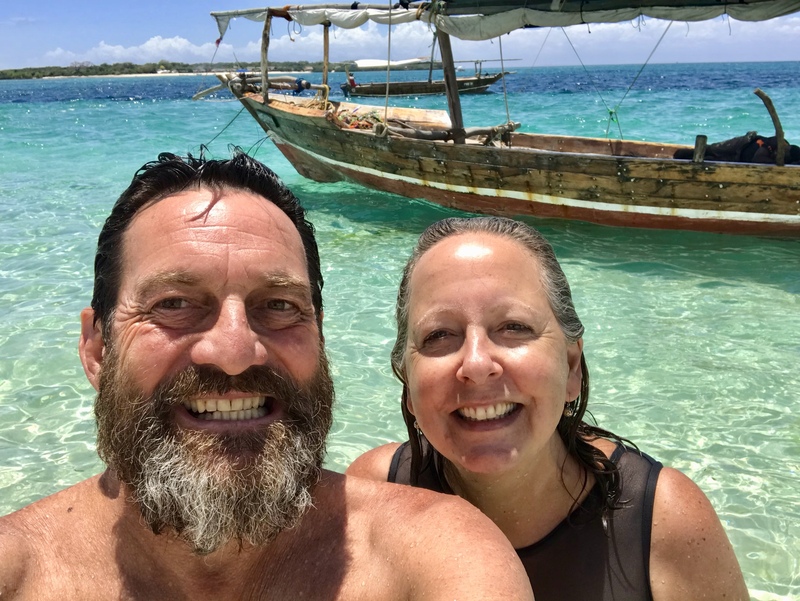 November 6, 2018 November 6, 2018 Marcus and Pauline8 Comments on Fred Astaire and the Mana Pools National Park. Fred Astaire and the Mana Pools National Park. We left Victoria Falls reasonably early for the border crossing and leaving Zimbabwe was relatively easy and quick and the drive over the Victoria Falls bridge was a bit of a hoot! On entering the Zambia border post however we were immediately set on by professional fixers who charge a fee to help get you through the process but by now we were quite well versed on how it all works so politely declined their invitation. We did however employ the services of a bloke to keep the baboons off our vehicles for 1 US dollar! Once through the border we drove the short distance to Livingstone where we organised our Comesa Insurance which is a compulsory third party vehicle insurance which will cover us in most Central and East African countries. We then picked up a phone sim and a few bits and pieces of vehicle safety equipment required in Zambia and other countries such as reflective tape for the front and rear of the vehicles and Fluro vests. Of coarse we had to have coffee and found a cafe that made amazing coffee right next door to the phone sim shop. Lastly we filled the Landcruiser and five 20 litre jerry cans with diesel and set off north. After having lost so much time in Livingstone we drove until 5.30pm which is much later than our normal rule of to be in camp by no later than 4pm but we still had about an hour of daylight so all was good. We stayed on a working farm where they raised pigs, cattle, goats and normally some feed crops but this year has been such a bad drought they have not been able to get any crops in. It was a nice quiet place and we were the only campers there so we got to have a good chat with one of the owners Kim. Her children go to boarding school in Harare and only get home at the end of each term and sometimes a long weekend mid term. To do this the kids have to hop on a bus at 6.30am and get home at around 6.30 that night. The next morning we set off on a horrendous pot holed road for the border crossing at Chirundu to cross back into Zimbabwe so we could go to the Mana Pools National Park. Unlike most border crossings all the formality’s for both countries are done in one building and it can be quite confusing but we muddled our way through with big cheesy grins which I find works really well! That night we stayed at the Jecha Point Fishing Lodge right on the Zambezi River and what a fantastic place it was. Owner Nick greeted us with open arms and gave us a beautiful campsite on lovely green grass right beside the river. Then he told us that a man would come along and light our camp fire and even do our dinner washing up! Of coarse I declined the kind offer as I think we are both still capable of doing these tasks! That afternoon we were sitting reading in the shade when we heard a man whistling and then yelling out hello a few times so we looked up and there was a giant bull elephant wandering up to the tree we were camped under to eat the Acacia seed pods which are a delicious treat to them. Later in the night we were also visited by a hippo who grazed on the nice green grass all around us! Our friendly bull elephant at echo Point Fishing Lodge. The next morning we were up early to drive into the Mana Pools National Park thinking that with the campsite fees and permits that we had organised in Victoria Falls we would be able to go straight to the campsite but no we were told at the entry gate there was another permit we would need and to get that we would have to go to the next town. So off we went to get the permit that we still have no idea what it was for but were told that it was free and then backtracked to the entry gate. We arrived at the camp and again we were right on the Zambezi River looking out over an island in the river that Ellies swim out to. The campsite itself was huge but again only a handful of people staying here. Our campsite at Mana Pools. There are some very special residents at Mana Pools in the form of some old bull elephants who have been fitted with collars to monitor their movements. Two of theses old boys are called Fred Astaire and Boswell and they both have mastered the ability to stand on their hind legs to reach the tasty morsels high in the trees. We did see them come into camp as well as out and about but sadly didn’t see them do their party tricks! Our first day was spent driving around the many pools (lagoons) in search of animals but unlike most other parks we were struggling to find many animals. We did see a Spotted Hyena and a magnificent Kudu buck which was special. We were away from the camp from 6am until 11am and returned to find baboons all over our Karavan and they had damaged a roof hatch in their efforts to get in. This was more a nuisance than any real damage but I didn’t want them to do more damage so organised for a 19 year old local girl called Shanae to watch our camp each time we went out. There has been a sustained drought around here and there is not much feed for the animals, however the landscape had changed quite a bit in that we now had more open country with big trees as opposed to small scrub and the most impressive trees were the giant Baobabs and Fig trees but also the huge sausage trees. A beautiful Baobab tree splitting the road! We did get to see lots of Ellies who were a bit smaller than what we have been seeing up to date but they did have much longer tusks than what we had seen. Also there were many more young elephants in the families which is a really good sign. There were lots of baby elephants in Mana Pools. The elephants enjoyed grazing on the lush grass along the Zambezi River. Other animals seen were Eland, Lions, Painted Dogs, Zebra, Impala, many baboons and Vervet Monkeys and in the pools a huge number of Crocodiles some as big as 5 metres long. On one night at around 7.30pm Pauline said to me that she thought she had seen something walking past in the dark so I shone the torch in the direction and a big Lioness was walking through our campsite not more than 5 metres away and on further looking around we saw that she was being followed by two other Lionesses! Well that really shook us to the core and all that night we could hear the male lion calling out to them with a roar that would rattle your bones! Later on we heard a huge commotion and found out the next morning that the lioness’s had killed an Eland just one kilometre away and we went out to have a look at them and what was left of the Eland. Thankfully we were not on the menu the night before! Mana Pools was also another place where we met two Aussie couples who were over holidaying for four weeks and had hired 4WD campers. They were being guided by one of the Aussie blokes sister Karin who lives in Port Elizabeth in South Africa and has her own 4WD set up very well. We got on very well with them and I actually had to yell out to them to warn them about the three lionesses because they were having a great old time and would not have noticed! Karin very kindly wrote down some great tips for our future travels and also left us with a slingshot for deterring the naughty Baboons and Vervet monkeys! We hope to call in and see Karin on the way back down and she may even join us fore a short time. One morning we went out to look for one of the packs of Painted Dogs that are in the park and we just had no luck finding them until I pulled up alongside a guide and asked him if he knew where they were. He said he did know and he was going to see them right then and for us to tag along. When we arrived at the spot we could see why we hadn’t seen them because they were a good 150 metres off the track under a shady tree and just looked like small logs from the road! The Painted Dogs asleep under a tree. There were four adults and four, 4 month old pups in the pack with one of the adults wearing a tracking collar. While we were there we met a man by the name of John Stevens who had the most bright blue eyes and was resplendent in his khakis and gaiters with what looked like an Akubra hat. We got talking to John and I’ve always said that everyone has a “story” and just from having spent 20 minutes with John I knew he would have an amazing story to tell. It sounds like he has been guiding for most of his life and he also introduced me to his tracker who had been with him for many years and was reputed to be one of the best in the industry but alas I have forgotten his name. A fine tracker of great repute. I did however get John’s phone number and hope to catch up with him on the way back in Harare to find out his story. Anyway back on track….John suggested that we return to the same spot at around 4pm because the Painted Dogs sleep all day and then late in the afternoon they wake up and greet each other like they hadn’t seen each other in years. So we did return at around 3.45pm and walked in about 100 metres and sat under a shady tree to wait for them to wake up. Mana Pools National Park is the only one where you are permitted to leave your car and walk with or without a guide. We felt very safe doing this because it was in an area that was quite clear of vegetation and we had the ability to see anything coming for quite some distance. Shortly after 4pm we were joined by three serious photographers who had an armed guide with them so we felt a bit more comfortable about our safety! It was a long wait and eventually the dogs woke at 5.30pm and sure enough they all ran around in great excitement greeting each other and the pups had a great time play fighting with each other. We stayed until sunset and then drove back to the camp site very pleased with the days results. Just delighted to see and greet each other after a sleep! The next morning we returned to the Jecha Point Fishing Lodge for two nights to catch up on clothes washing and vehicle maintenance both of which are always ongoing! This hippo came in to our camp at echo Point every night and grazed on the lawn! No blog post is complete without an African sunset photo! It has been incredibly hot for a sustained period now with every day for the last at least 4 weeks being between 38c and 40c. What makes it hard to deal with though is that by 9am it’s already 35c, reaches the maximum by 11am and then holds that until around 6pm. Overnight it is very hot and doesn’t really go below 25c so sleeping has been difficult. We are however starting to get used to it, our consumption of water during the day is quite incredible and we still end up at the end of the day quite dehydrated. We haven’t seen a drop of rain now for around two months but the build up is certainly starting to happen because the humidity is increasing day by day. Then next morning we set off to cross back into Zambia and head for the South Luangwa National Park. Another wonderful account of your travels – I love reading them & continue to wish you safe travels. Great stories & photos as usual guys. Next South Luangwa National Park in Zambia.